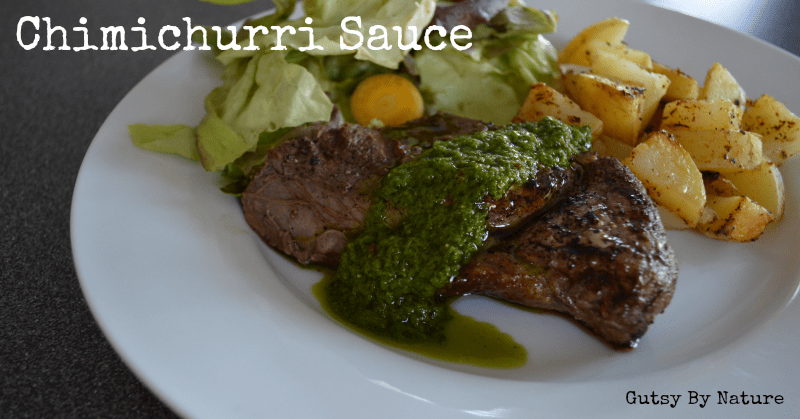 If you’ve never had chimichurri sauce made from fresh herbs, plucked just moments before from the herb garden, then you don’t really know what chimichurri sauce is! I first fell in love with this Argentinean sauce when I was a young hipster living in Madison, Wisconsin and one of my favorite night spots (the now closed Restaurant Magnus) served it with their complimentary focaccia. In the years since, I’ve been working to to perfect my own recipe for chimichurri and think I have finally done it! Now, instead of mopping it up with bread, I use it in the way it was actually intended – as a sauce for grilled meats. Chimichurri is a seasonal sauce for me… This is the time of year that my little patio herb garden starts growing so dramatically that you can harvest a bunch of herbs one day and then come back the next and not even be able to tell. I look forward to this all winter long – refusing to buy fresh herbs at the grocery store since I know that eventually I will have so many that I start pushing them on neighbors and friends. Paleo Autoimmune Protocol (AIP): Omit the red pepper flakes. Specific Carbohydrate Diet (SCD): Legal as written. Low-FODMAPs: Omit the garlic and use only the green part of the scallion. 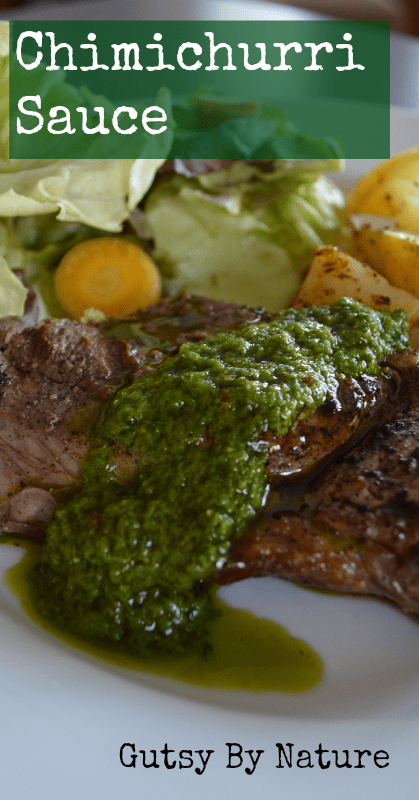 This chimichurri sauce is a delicious way to use fresh herbs and jazzes up grilled meats. Place unpeeled garlic in a skillet over medium-low heat 5-10 minutes, until fragrant and spotty brown – shake occasionally to make sure it doesn’t burn. Allow garlic to cool enough to handle, then peel and put in blender or food processor with parsley, oregano, scallions, vinegar, and red pepper flakes. Pulse a few times to chop pieces a bit smaller. With motor running, slowly drizzle in olive oil and continue processing until a uniform, emulsified sauce is created. Season to taste with salt and pepper. Serve with roasted meats, vegetables, and more!